The mining industry pre-dates sophisticated simulation software and the computers it runs on by thousands of years. As an essential modern industry, however, the technical and analytical capabilities offered by AMPHOS 21, a COMSOL Certified Consultant, are critical for both understanding and optimizing mine operations. Recently, we sponsored a webinar together with NASA Tech Briefs on “Mining and Hydrogeology: Porous Media Flow Simulations with COMSOL”, featuring environmental consultants Jorge Molinero and Elena Abarca from AMPHOS 21. Here are some of the highlights. Jorge presented many interesting porous media flow examples in the webinar, one of which was a multiphysics simulation of a leach pad. Heap leaching is a metallurgical process used to extract metals and other compounds from the ore recovered from underground mines. The figure below is from the webinar and provides a brief overview of the process. Image courtesy of AMPHOS 21. The host or base layer consists of low permeability rock that is covered by an impermeable geomembrane to prevent ground contamination. A drainage system is built on top of the geomembrane that enables collection of the metal-enriched solution. To create this metal-enriched solution, ore is “heaped” on top of the drainage layer and an irrigation system delivers an acidic solution that can dissolve metals from the ore. After some time, additional layers of ore and irrigation are added to the heap. While I was watching the webinar, this particular example caught my attention largely because it is an intriguing model requiring a hydro-chemical-mechanical physics coupling, as explained below. The participating physics within the modeled system and their effects on each other. Image courtesy of AMPHOS 21. Notably, soil mechanics affect permeability, which is a major determinant in groundwater flow. 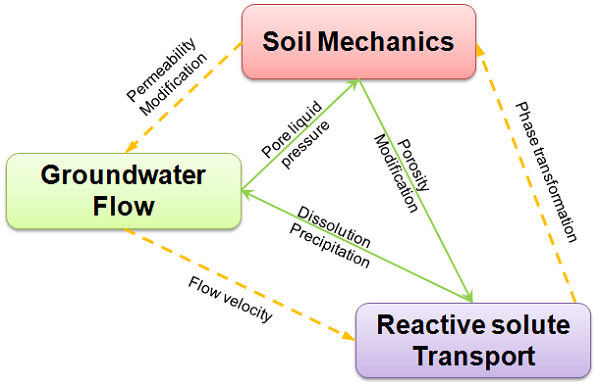 Changes in groundwater flow velocity impact reactive solute transport where the subsequent phase change can, in turn, affect the mechanical properties of the soil. The green arrows in the figure above represent further couplings between the participating physics. This includes the poroelasticity and subsequent deformation of the soil due to the groundwater flow, and the resulting chemical dissolution and precipitation brought about by changes in the pore volumes. The contribution of chemical and mechanical effects on the porosity over time. Image courtesy of AMPHOS 21. 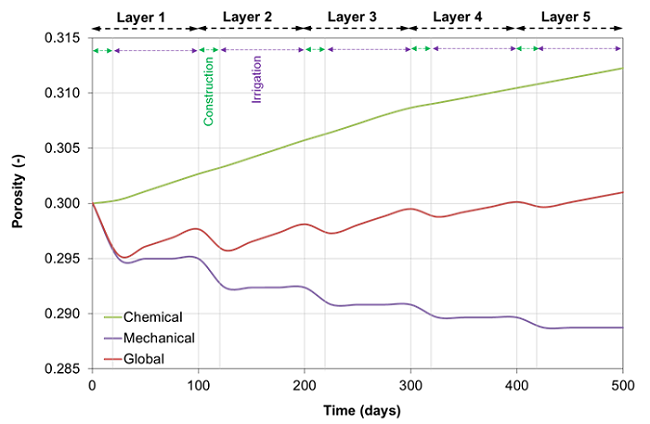 This plot demonstrates the impact of chemical, mechanical, and combined global effects on porosity evolution in each layer of the leach pad model for a transient analysis that spans many days. Notice the remarkable impact of chemical reactions to increase porosity relative to the mechanical effects. Mechanical effects account for the increased load where adding more layers to the heap causes further compaction and reduced porosity. Irrigation of the ore using acidic chemicals, however, has the opposite effect and dissolution of the materials increases porosity throughout the heap. Global effects take into account both the chemical and mechanical contributions to porosity evolution. Toward the end of the webinar, Elena showed how to set up and solve a model of groundwater drainage for an underground mine. 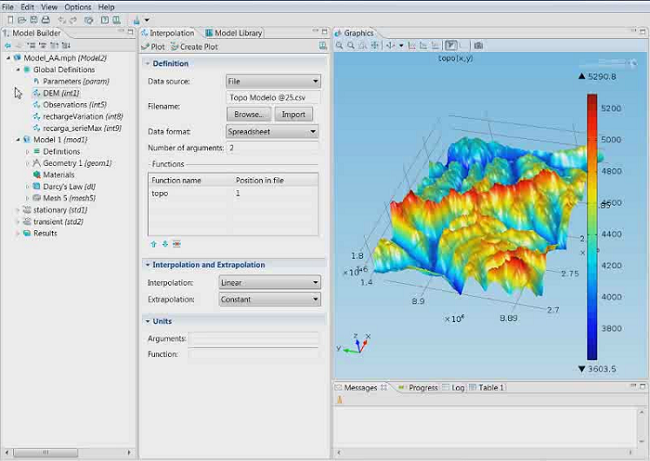 The demonstration featured many useful tips and tricks for importing and working with complex geometries in the COMSOL environment, as shown below. Imported surface topography from Elena’s demo in COMSOL Multiphysics. Image courtesy of AMPHOS 21. A ground surface topography is imported, augmented with rivers and lakes, and then combined with the geometry of an underground mine. The geometry is meshed so that a specific region of interest has a very fine mesh, and then a coarser mesh is used to discretize the surrounding structures. This is a valuable technique that can reduce computational complexity and save time. After associating physics with the imported geometry for this hydrogeology simulation, both stationary and transient study types are used to evaluate groundwater drainage behavior in the model. To conclude the demonstration, Elena provided interesting results and analyses including the evaluation of flow, depth-dependent permeability, 2D cross sections, and a water-mass balance. 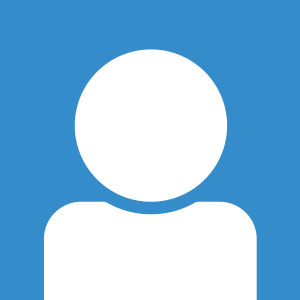 For those of you looking to learn more about what AMPHOS 21 specializes in, you should check out the AMPHOS 21 Certified Consultants page.